A deliciously soft, caramely popcorn that you will be making over and over again. I actually don’t love store bought caramel popcorn. Its too hard, and I don’t really love the flavor. But homemade caramel popcorn is amazing. And this treat is so easy, that I have made it 3 times in the last month or so. (So, if you are only a fan of store bought caramel popcorn, this might not be the recipe for you). But let me tell you, it is delicious, and soft, and caramely, and perfect. Yum. In a medium sized microwave safe bowl, put butter, white sugar, brown sugar, condensed milk and corn syrup. Microwave for 2 minutes. Stir. Microwave for 2 minutes. Stir. Microwave for 2 minutes. Stir. (6 minutes total). Meanwhile, pop corn. (Using a popcorn popper, or if you know how to do it on the stove top). Place in 2 bowls. When caramel is done microwaving, add vanilla and baking soda. Stir. Pour about half of the caramel over one of the bowls of popcorn. Stir. Add a little more popcorn then a little more caramel, while stirring, until everything is added. Enjoy this gooey caramel popcorn for a delicious sweet snack! This looks great, but how do you serve it to a group of people! I’ve tried a few different caramel popcorn recipes but haven’t found the perfect one yet! I really want to try this one…you don’t bake it at all? I tried a recipe last week that didn’t require baking and it turned out super soggy! Help!! Destinee, I have never tried baking caramel popcorn before, but I am actually not a fan of crunchy/hard caramel popcorn. I wouldn’t call this soggy, but the caramel is gooey and sticky. Let me know what you think if you try it. Thank you for responding so quickly!! I will definitely give it a try! Thanks for sharing your recipe! Happy to share it! You could try spreading it on a cookie sheet and baking it for a few minutes to get it crunchy. Maybe? I have a recipe that after you pour on your caramel sauce, you put in a large paper grocery bag and put in the microwave for 1 minute. Take out and shake, put in microwave for another minute and then spread on wax or parchment paper to cool. It doesn’t turn out soggy nor is it overly crunchy! I actually like the texture a little gooey, but I will have to try your method sometime soon. Sounds good! I SO want to try this. I don’t have any corn syrup though. Is there anything I can sub for it? Jennilee, I haven’t tried anything else with this recipe, but you could try making your own simple syrup at home, by boiling about 1 cup of white sugar and 1/4 cup water till sugar dissolves (makes 1 cup). Otherwise here is another recipe for homemade corn syrup I found for it http://www.food.com/recipe/homemade-corn-syrup-substitute-simple-syrup-74080 Let me know if it works if you try it! Oh my goodness I want this. http://jamiecooksitup.blogspot.com/2011/10/crunchy-candy-bar-caramel-corn.html I made this recipe using the bag, it was a regular sized paper lunch bag. I guess I put in 1/2 cup unpopped corn in the bag – when I poured it out, it filled my LARGE tupperware bowl. 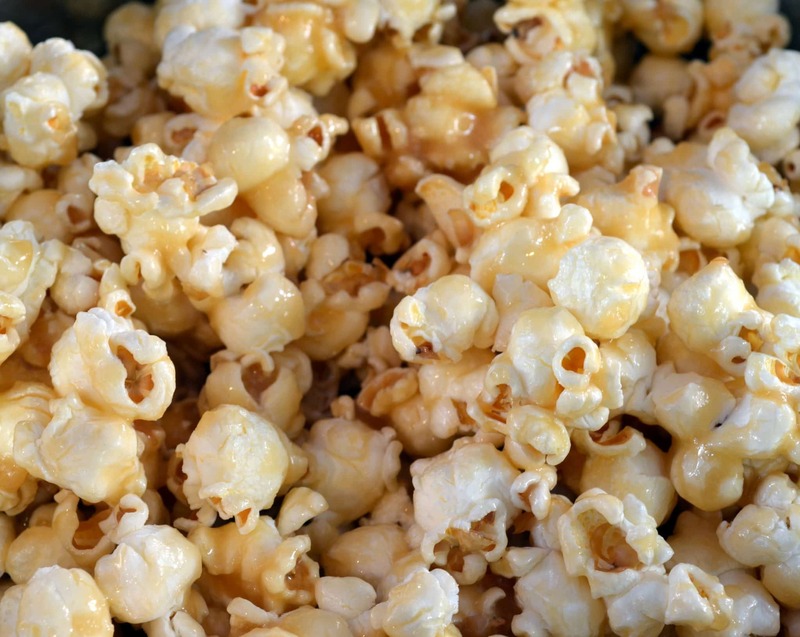 You can pop regular popcorn in the microwave and it tastes just as good and works great. Place your unpopped corn in a paper bag. Turn the ends down twice. Lay the bag face down in the microwave and pop for about 3 minutes. Just quit when the kernels popping is longer than about 5 seconds inbetween. You might have to adjust time more or less for your own microwave but it works. How much will fit in the bag? This recipe needs a lot.